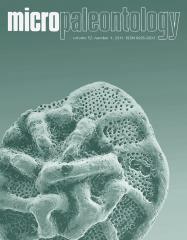 ABSTRACT: Diverse and well-preserved assemblages of early to late Campanian silicoflagellates from the Smoking Hills andMason River formations exposed in the District ofMackenzie, Northwest Territories, Canada include twenty-one known species and five new species in six genera. These include a rare occurrence ofCornua trifurcata and unusual skeletalmorphologies of genus Arctyocha. These assemblages provide a new means for biostratigraphic division of the Upper Cretaceous through an expanded silicoflagellate-based zonal framework comprises five zones.